Gerontology instructor Krystal Culler with her canine trainee, Lady. When Gerontology instructor Krystal Culler approached the university about bringing service dogs in-training into the classroom, she never guessed how much her students would like the idea. But Culler’s primary purpose for including Lady in class is to make students aware of how service animals can be used in social service careers. “Social work and gerontology are shifting toward more creative uses of service and therapy dogs, especially in work with dementia patients,” she said, describing ways a trained animal could provide support and security to allow an Alzheimer patient to live longer in their own home. The Veteran’s Administration recently revised its policies to allow funding for working veterans who could benefit from a service or therapy dog, she said, and that change will certainly expand their use as well. Amanda Parsons, a senior Gerontology major from Youngstown who also works full-time in Undergraduate Admissions, has shared a class with Lady. 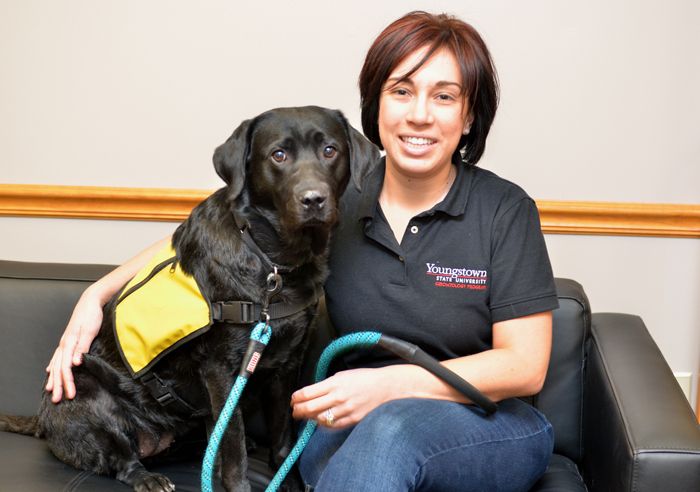 She’s gained insight on the use of service dogs, especially in nursing homes. “They make patients smile and they can help to bring back memories,” she said. Carrie Mitchell of Youngstown has worked in the corrections field, so she’s already seen how service dogs can help in that venue. Now, as a senior majoring in Public Health, she’s more aware of canines’ usefulness in healthcare fields. Culler is a volunteer puppy trainer for Canine Companions for Independence, a non-profit service dog provider based in California, and for Pet Partners, a non-profit therapy dog provider based in the state of Washington. A native of West Virginia, Culler earned an undergraduate degree in sociology and gerontology at YSU, completed a master’s degree at the University of Akron and is now working on a doctorate. As puppy trainers, she and her husband, Jacob, have spent the last 16 months working to teach Lady 30 commands, including getting in and out of a vehicle and toileting “on command” in less than 30 seconds. When she’s ready, she’ll complete her training at the agency headquarters and, if successful, will be matched with a client.